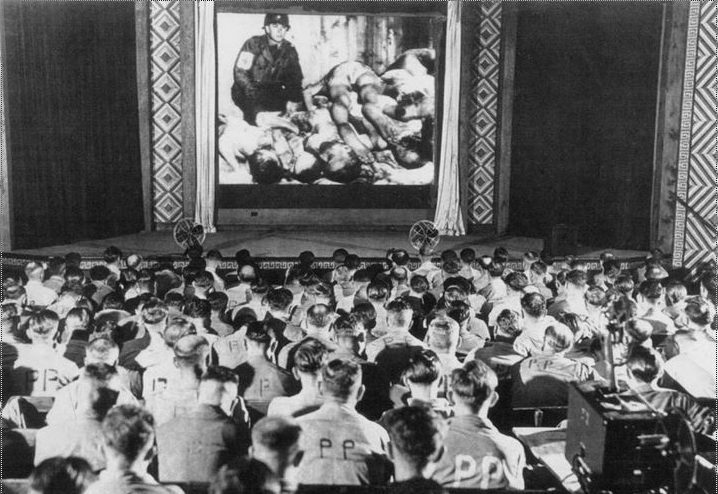 Everyone knows the horrors of the Nazi regime, but few people can say that while they thought it was all a part of war, until one day they were forced to see it for what it really was…horrible. 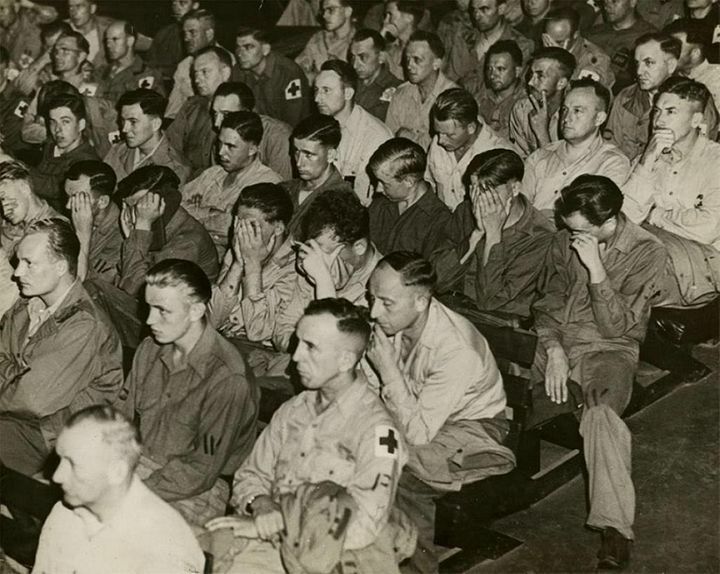 These soldiers honestly thought that the concentration camps were no different than the prisoner of war camps they were in, but when they saw the truth, it made them sick. They were forced to face the awful truth that their leader was a complete monster…and worse yet, that they could do nothing to stop his tirade. This forced confrontation brought Germans face-to-face with the worst works of the Third Reich. I can’t imagine the horror of finding out that human beings were being murdered in the gas chambers. The absolute horror of it shows on the faces of the prisoners of war in the United States camps, as they compared the treatment they received at our hands, to what the Nazis were doing to the Jewish people. An important part of keeping moral up in any war is making sure that the people believe that what their nation is doing, is the right thing. To find out that their nation…their leader, Hitler…was involved in the unwarranted killing of human beings, just because these people were a race they did not like, had to have been such a shock…a sickening shock. This forced process was part of the Allied policy known as denazification, which was designed to to purge Germany of the remnants of Nazi rule and rebuild its civil society, infrastructure, and economy. The program included actual visits to nearby concentration camps. Posters displaying dead bodies of prisoners hung in public places, and forced German prisoners of war to view films documenting the Nazis’ treatment of “inferior” people. The German people had to be changed. They had to realize that Hitler’s evil agenda could not continue. The only way to do that was to change the hearts of men. The best way to change the hearts of men is to show them the horrible truth that they have been lied too and taken advantage of. While such a harsh method designed to facilitate change was necessary, I must think that it was as hard on the Americans as it was on the Germans. I don’t think anyone could easily watch such horrible murders, without feeling something…except maybe Hitler and his serious henchmen. 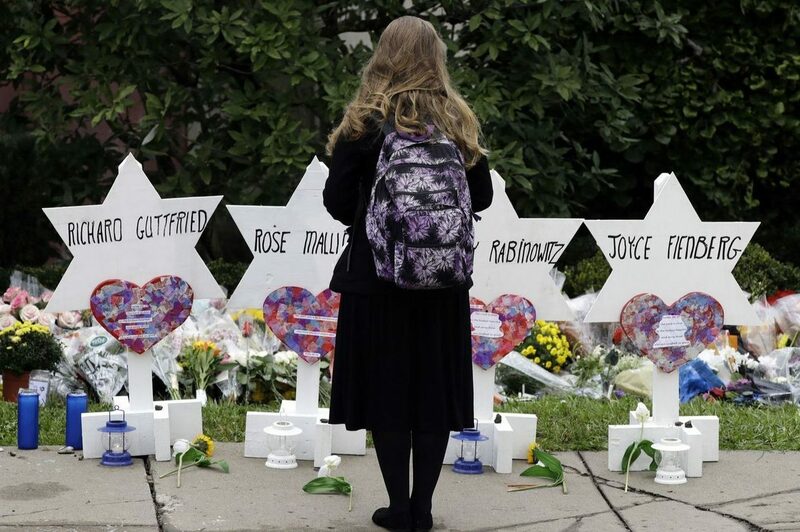 I still believe that the majority of human beings cannot easily stomach blatant hatred, and horrific murder. I can’t say exactly how big an impact the denazification efforts had at that time in history, but I believe that it was huge. The reason is that the German soldiers weren’t necessarily Nazis, and the Holocaust was just one side of the World War II. They were also fighting for territory and power. Strong nationalistic feelings were quite normal back then. Oddly, no conflict existed between not following the Nazis and fighting for the “good of your Fatherland.” Some soldiers were Nazis, some just wanted revenge for Versailles, others wanted to sit at the same table as France and Britain. And many followed because they had no other choice. It was a very strange situation, and one that had to be changed. It may not have been a humane way to bring change, but it was all they could do, so denazification was what they did…and at that time, it worked. 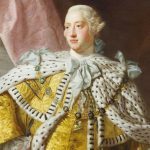 The American Revolution was a serious embarrassment to Britain, and especially to King George III. The king had to admit that things weren’t going well in the colonies…at least not where Britain was concerned. By now, the colonists had signed the Declaration of Independence that summer, and they were not going to be moved from achieving their goal to be a sovereign nation. On this day, October 31, 1776, the king give a speech to the British Parliament, telling them about the signing of the United States Declaration of Independence and the revolutionary leaders who signed it, saying, “for daring and desperate is the spirit of those leaders, whose object has always been dominion and power, that they have now openly renounced all allegiance to the crown, and all political connection with this country.” I’m sure he felt that the colonists were rebels, who were not worth wasting time on by now, and he hoped he could walk away from them without losing face any more than he already had. The British never intended for the United States to be anything more than the colones. The king went on to inform Parliament of the successful British victory over General George Washington and the Continental Army at the Battle of Long Island on August 27, 1776, but warned them that, “notwithstanding the fair prospect, it was necessary to prepare for another campaign.” Somehow, the king had the idea that there was still hope to keep the colonies. Despite George III’s harsh words, General William Howe and his brother, Admiral Richard Howe, still hoped to convince the Americans to rejoin the British empire in the wake of the colonists’ humiliating defeat at the Battle of Long Island. They hoped to do thing peacefully, but that was just not to be. 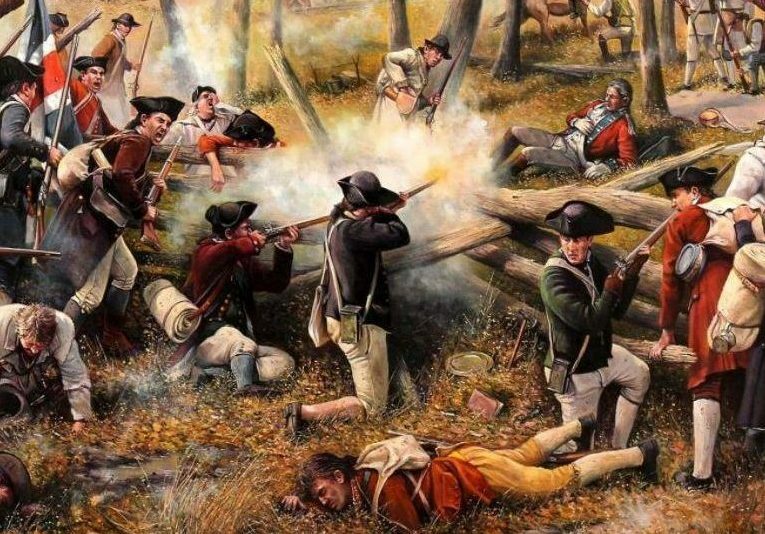 The British could easily have prevented Washington’s retreat from Long Island and captured most of the Patriot officer corps, including the commander in chief. 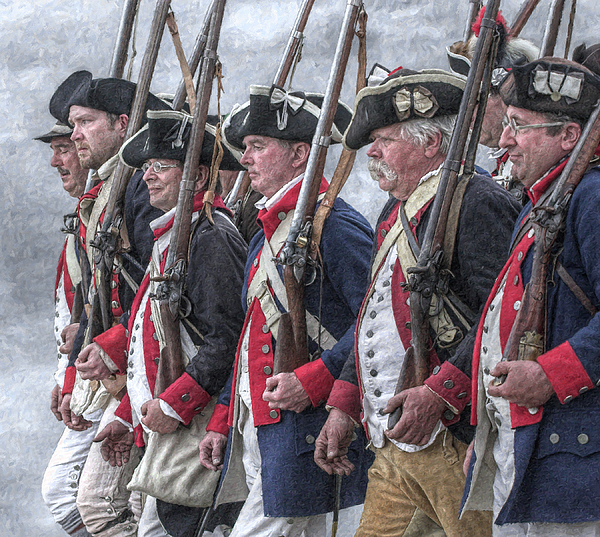 However, instead of forcing the former colonies into submission by executing Washington and his officers as traitors, the Howe brothers let them go with the hope of swaying Patriot opinion towards a return to the mother country. 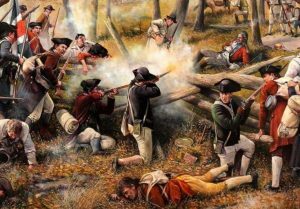 The Howe brothers’ attempts at negotiation failed, and the War for Independence dragged on for another four years, until the formal surrender of the British to the Americans on October 19, 1781, after the Battle of Yorktown. The freedom of the United States was not going to be taken from them…and that was a serious embarrassment to Britain. It seems there is always talk of the Third World War coming, and what might set it off. Most people hope that it stays all talk, because the weapons that are available these days could potentially wipe the human race off the planet, or at the very least, wipe whole nations off the map. Sometimes I wonder how we have avoided it so far, considering all the hate in the world today. Somehow our world leaders have held it off…for now. Nevertheless, there have been times when we have come very close to the last straw that would bring World War III. For 16 hours, between October 27 and October 28, 1961, at the height of the Cold War, US and Soviet tanks faced each other in divided Berlin in an action that brought the two superpowers closer to kicking off a third world war than in any other cold-war confrontation, with the exception of the Cuban missile crisis one year later. It was a very heated time in history. Washington and its British and French allies had failed to stop the Russians from building the Berlin Wall in August of 1961. 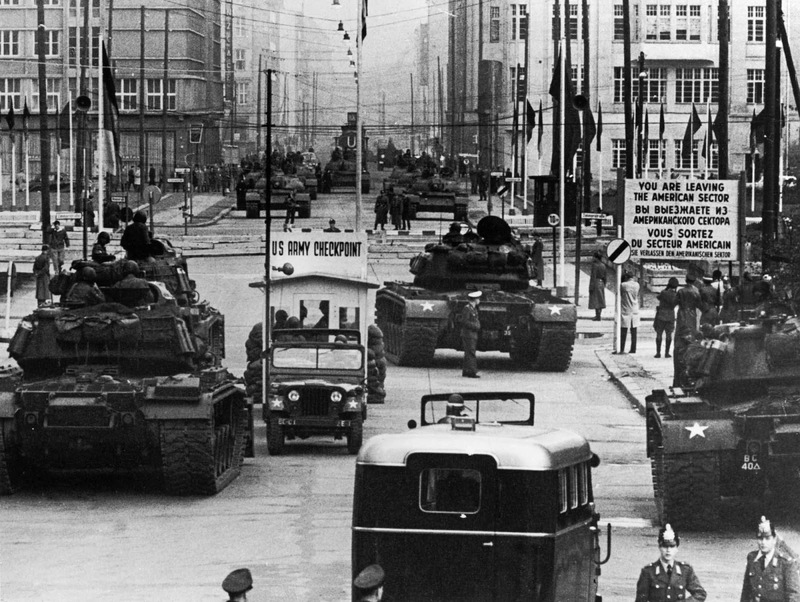 By October, East German officials began to deny US diplomats the unhindered access to East Berlin that they were required to allow as part of the agreement with Moscow on the postwar occupation of Germany. Then, on 22 October, E Allan Lightner Jr, the senior US diplomat in West Berlin, was stopped by East German border guards on his way to the state opera house in East Berlin. The East Germans demanded to see his passport, which he insisted only Soviet officials had the right to check. The situation grew more heated with this exchange. Lightner was forced to turn back. General Clay, who was an American hero of the 1948-1949 Berlin Airlift was sent by Washington to deal with the Russians after the erection of the Berlin Wall. He gave orders that the next American diplomat entering East Berlin be escorted by armed US army military police in jeeps. The maneuver succeeded, but the East Germans continued to attempt to assert their claim to control western allied officials entering East Berlin. Never one to suffer defeat easily, Clay ordered American M48 tanks to head for Checkpoint Charlie. There they stood, some 80 yards from the border, noisily racing their engines and sending plumes of black smoke into the night air. Alarmed by the apparent threat, Moscow, with the approval of the Soviet leader, Nikita Khrushchev, sent an equal number of Russian T55 tanks rumbling to face down the Americans. 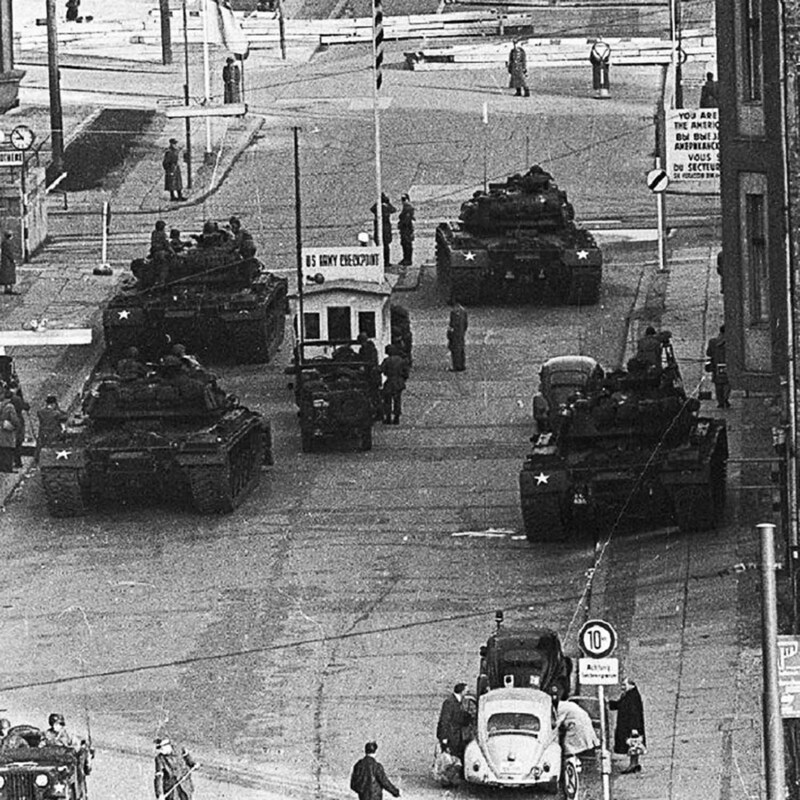 They too ground to a halt some 80 yards from the East/West Berlin border and, as with the US tanks they faced, stayed there for 16 hours. American officials were becoming more and more alarmed by the potential consequences. General Clay was quickly reminded by Washington that Berlin was not so “vital” an interest to be worth risking a conflict with Moscow. President Kennedy approved the opening of a back channel with the Kremlin in order to defuse the situation that had blown up. 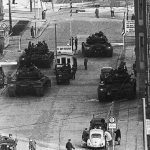 As a result, the Soviets pulled back one of their T55s from the eastern side of the border at Friedrichstrasse and minutes later an American M48 also left the scene. That was how it went until all the tanks were withdrawn. General Clay’s reputation among West Berliners rose, but not so much his warrior capabilities as far as the united States was concerned. Khrushchev had been equally uninterested in risking a battle over Berlin. In return for Kennedy’s assurance that the west had no designs on East Berlin, the Soviet leader tacitly recognised that allied officials and military personnel would have unimpeded access to the East German capital. From that point on, the western allies freely dispatched diplomats and military personnel to attend the opera and theater in East Berlin. 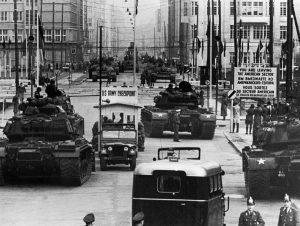 Soviet diplomats, too, attended functions in West Berlin and sent Volga limousines packed with Soviet military police on patrol to West Berlin. The elaborate routine served to prove that the Four Power status of the city was intact. It was faithfully observed until the Wall fell in 1990. they weren’t as eager to start World War III as they thoughts they were. When I think about secrets, nothing very sinister comes to my mind, but when it comes to national or world secrets, maybe we should think a little differently. Of course, not every world or national secret is sinister, but some can be pretty odd. I don’t claim to be privy to any current national security secrets, but I’m finding out some from the past. There were some secrets that most people don’t know about, and some that almost seemed like science fiction. In 1959, the United States used to have a small underground city in the North Pole called Camp Century. It looked a lot like the rebel base on Hoth, which is the sixth planet in the remote system of the same name, and was the site of the Rebel Alliance’s Echo Base, as Star Wars fans would already know. Hoth is a world of snow and ice, surrounded by numerous moons, and home to deadly creatures like the Wampanoag…a cross between a polar bear and a Sasquatch, in looks anyway. Of course, that isn’t what Camp Century really was. When Camp Century began its life, it was as a scientific outpost located hundreds of feet beneath a Greenland iceberg. From the surface, it looked like nothing more than an ominous snow-covered pyramid. But below, it was gigantic. The base was powered by an underground nuclear reactor, and at one point, is said to have housed a staff of 200. It was a self-contained city, complete with a gym, a chapel, a library, hobby shops and even a movie theater. I wonder what kinds of movies they watched…movies about the outside world, and in summer no doubt. The plan was for scientific experiments to be conducted there, but as sometimes happens, the military decided it could be better used as a base for their own experiments…namely blowing things up. I suppose they assumed that there was little chance of anyone getting hurt, because of the remoteness of the base. The best kept secrets exist here, and I don’t think I have a big problem with that. 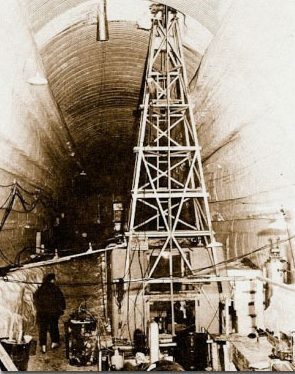 So, to recap: The United States had a 200-person nuclear-powered outpost located beneath the ice of the North Pole, where one of their primary objectives was to drill as deep into the unforgiving, ancient ice as possible. Now, that sounds scary. The military took over in about 1960 and converted Camp Century into a giant ice-bound missile silo. 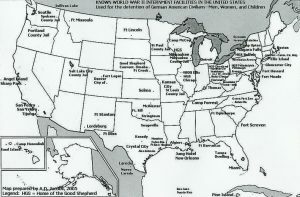 Called Project Iceworm, the goal was to store approximately 600 nuclear missiles in the base, giving the United States a nice, secret little nuclear facility right next to Soviet Russia. Luckily for Russia, technical problems led to the whole mission being scrapped, because maintaining the tunnels was a constant chore. 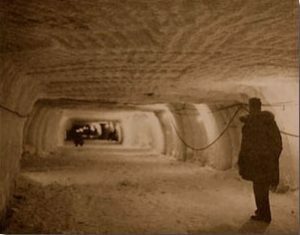 Every month, 120 tons of ice had to be removed to maintain the tunnels. The whole site collapsed within the that decade. Apparently, they worked harder at keeping the tunnels cleared, than at any experiment, or missile setup that they did. 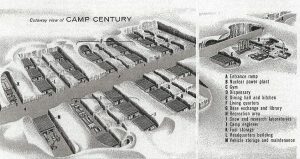 The unites States Department of Defense told the Danish government that the “official purpose” of Camp Century was to test various construction techniques under Arctic conditions, explore practical problems with a semi-mobile nuclear reactor, as well as supporting scientific experiments on the icecap. The process involved cutting a total of 21 trenches and covering them with arched roofs, within which prefabricated buildings were erected. With a total length of 1.9 mi, these tunnels contained a basically a small town, the total population of which was around 200. From 1960 until 1963 the electricity supply was provided by means of the world’s first mobile/portable nuclear reactor, designated PM-2A and designed by Alco for the United States Army. Water was supplied by melting glaciers and tested to determine whether germs such as the plague were present. Once it was cleared, they were able to use it. Nevertheless, fraught with trouble from the start, it proved a better idea to close it down. 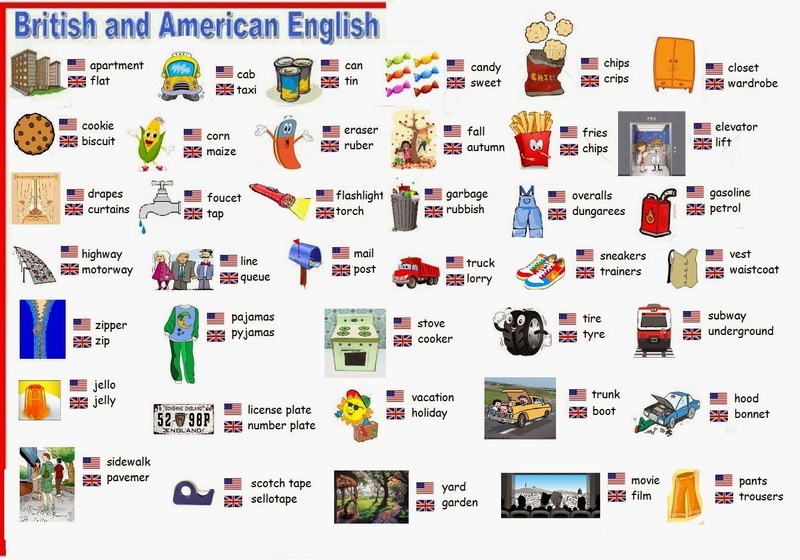 When the colonists left England to form America, they were like the younger sibling, at least when it came to language and much of how they ran the country. Nevertheless, like that younger sibling, things began to change pretty quickly. Part of the change was due simply to distance. When you don’t hear a language all the time, you begin to vary in your own speech. 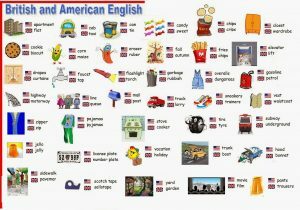 I didn’t really realize there was such a difference between American English and British English, other than the accent of course. Still, I noticed that more and more forms were asking which of the two I spoke. I always thought that it was an odd question, because English is English…right? Well, the correct answer is…wrong!! And when I thought about it, I knew that to be true. The changes began almost immediately after the first Englishman set foot on American soil. 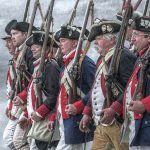 It all started with “Americanisms.” These “Americanisms” have been created or changed from other English terms to produce a language that differs from our forefathers, signifying our uniqueness and independence. I’m sure our founders were rather pleased with themselves with this process, if they realized it at all. By the time of the first United States census, in 1790, there were four million Americans, 90% of whom were descendants of English colonists. When I think of the speed of that growth, it strikes me as phenomenal to say the least. 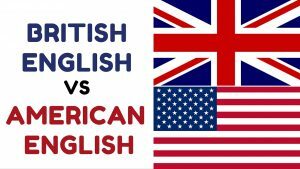 Because of the large English background, there was no question that our official native language would be “English,” but it would not be the same as that spoken in Great Britain. “Americanism” means a word or expression that originated in the United States. 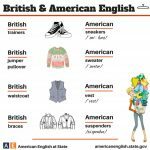 The term includes outright coinages and foreign borrowings which first became “English” in the United States, as well as older terms used in new senses first given them in American usage. In fact, by 1720, the colonists knew that we did not speak the same language as the people in England. The most obvious reason was, of course, the sheer distance from England. Nevertheless, that was not the only reason. 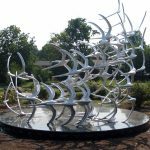 Over the years, many words were borrowed from the Native Americans, as well as other immigrants from France, Germany, Spain, and other countries. 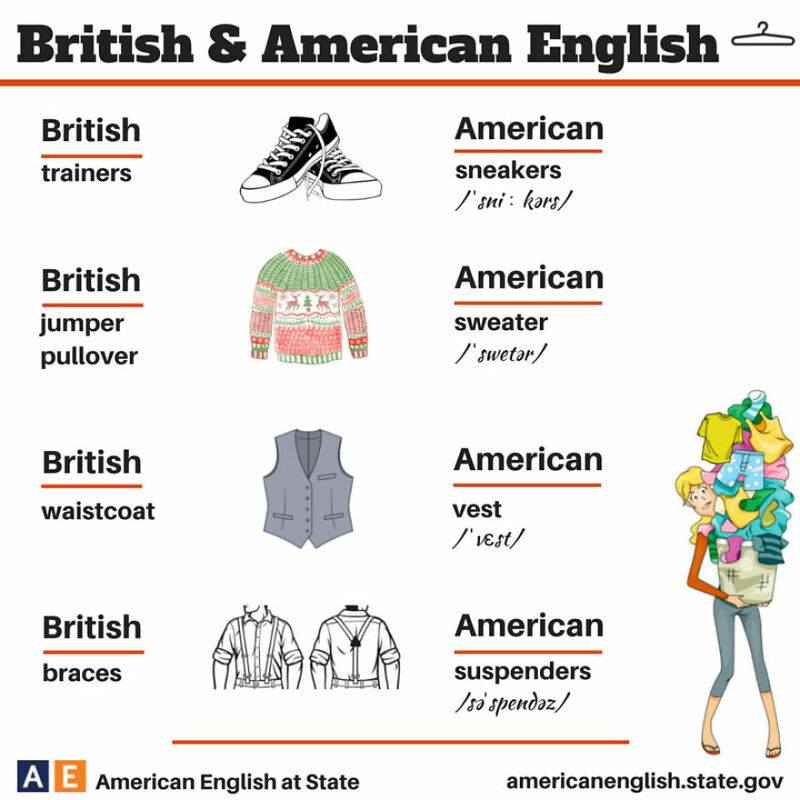 We had to communicate with the people around us too, and other words that became obsolete “across the pond,” continued to be utilized in the colonies. In other cases, words simply had to be created in order to explain the unfamiliar landscape, weather, animals, plants, and living conditions that these early pioneers encountered. These things might not have existed in England. By 1756, the English would make the first “official” reference to the “American dialect.” Samuel Johnson made note of it a year after he published his Dictionary of the English Language. Johnson’s use of the term “American dialect” was not meant to simply explain the differences, but rather, was intended as an insult. It was rather like calling our language the “low class” version of the English language. Remember if you will, that there were those who did not think the United States should ever be a sovereign nation. Years earlier…as early as 1735, the English were calling our language “barbarous,” and referred to our “Americanisms” as barbarisms. The English sneered at our language, something that continued for more than a century after the Revolutionary War, as they laughed and condemned as unnecessary, hundreds of American terms and phrases. Our newly independent Americans, were proud of their “new” American language, wearing it, as a badge of independence. In 1789, Noah Webster wrote in his Dissertations on the English Language: “The reasons for American English being different than English English are simple: As an independent nation, our honor requires us to have a system of our own, in language as well as government.” Our leaders, including Thomas Jefferson and Benjamin Rush, agreed. It was not only good politics, it was sensible. The feelings of the “rest of the world” didn’t matter. The language changed even more during the western movement as Native American and Spanish words became a part of our language. In 1923, the State of Illinois General Assembly, passed the act stating in part: “The official language of the State of Illinois shall be known hereafter as the “American” language and not as the “English” language.” A similar bill was also introduced in the U.S. House of Representatives the same year but died in committee. Now, after centuries of forming our “own” language, the English and American versions are once again beginning to blend as movies, songs, electronics, and global traveling bring the two “languages” closer together once again. Hitler was undoubtedly one of the most horrible dictators of all time, but what prompted him to become the evil man he was. The story actually begins before Hitler was even born. In 1868, a baby named Dietrich Eckart was born in Neumarkt, Germany, on March 23, the son of a royal notary and law counselor. My guess is that he had a fairly normal childhood…at least until his mother died when he was just ten years old. That may not seem like an event that was unique to Eckart, but somehow it was different, or would become different. Eckart’s life was further complicated when his father died seventeen years later in 1895. At this point, Eckart inherited a considerable sum of money, and started to study medicine in Munich. That would be the last of his somewhat normal life. He spent his father’s money very quickly, and recklessly. With his money gone, Eckart quit school, and began work as a poet, playwright, and journalist. He moved to Berlin in 1899, where he wrote a number of plays, often with autobiographical traits. 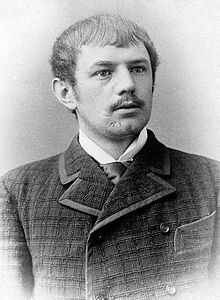 Apparently, he was about the only one interested in his plays, because despite becoming the protegé of Graf Georg von Hülsen-Haeseler, the artistic director of the royal theaters, he never was successful as a playwright. Taking his madness one step further, he blamed his failure on society. This was the beginning of the insanity that became Dietrich Eckart. Later on, Eckart developed an ideology of a “genius higher human,” after reading earlier writings by Lanz von Liebenfels. Eckart saw himself like Arthur Schopenhauer and Angelus Silesius, and also became fascinated by Mayan beliefs, but never had much sympathy for the scientific method. That makes sense, because he seemed to want to make up his own truths. Eckart also loved and strongly identified with Henrik Ibsen’s Peer Gynt. In 1913, when he moved back to Munich, he joined up with Rudolf von Sebottendorff’s right wing Thule Society, and became very politically active. He wrote the nationalist play “Heinrich der Hohenstaufe” (“Heinrich of the High Baptism”), in which he made the claim to world leadership for the German people, craziness that he would eventually pass along to Hitler. Soon he became the editor of the anti-semetic periodical Auf gut Deutsch. Eckart opposed the Treaty of Versailles, which he described as treasonous, and instead spread the so-called Dolchstoßlegende, which stated that the social democrats and Jews were to blame for Germany’s defeat in World War I. He was involved in the founding Deutsche Arbeiterpartei (German Workers’ Party) together with Gottfried Feder and Anton Drexler in 1919, which later on was renamed Nationalsozialistische deutsche Arbeiterpartei (National Socialist German Workers’ Party, NSDAP). He invented and published the NSDAP’s own periodical Völkischer Beobachter, and also wrote the songtext “Deutschland erwache” (Germany awake), which became the anthem of the Nazi party. Adolf Hitler was born April 20, 1889, just a few years before Eckart’s dad’s passing. During a speech he gave before party members on August 14 1919, Eckart met Adolf Hitler. 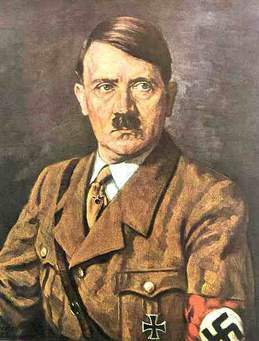 He exerted considerable influence on Hitler in the following years. Hitler looked at him as his “fatherly friend.” On November 9 1923, Eckart was involved in the Nazi party’s failed Beer Hall Putsch,as was Hitler. They were arrested and sent to Landsberg prison along with other party officials, but he was released again soon due to illness. He died of a heart attack caused by a morphine addiction in Berchtesgaden on December 26, 1923. Hitler later dedicated the first volume of Mein Kampf to Eckart, and also named the Waldbühne in Berlin “Dietrich-Eckart-Bühne” when it was first opened for the 1936 Summer Olympics. In 1925, Eckarts unfinished essay, Der Bolschewismus von Moses bis Lenin. Zwiegespräch zwischen Hitler und mir (“Bolshevism from Moses to Lenin. Dialogues between Hitler and me”), was posthumously published, although it has been shown that it the dialogues were an invention. The essay was, in fact, written by Eckart alone. I don’t know what Hitler would have been like had e not met Eckart. My guess is that the evil ideas Hitler had were there before their meeting, but I do believe that Eckart had a great influence on Hitler,and probably helped formulate some of the evil that was to come. Following instructions and paying close attention to those instructions are crucial to the safe operation of a plane, especially at take offs and landings. 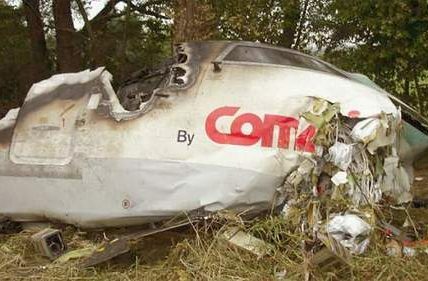 When the pilot of Comair Flight 5191 taxied to the runway of his takeoff, something went horribly wrong. 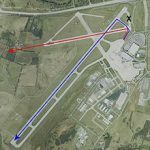 He was told to proceed to Runway 22, but he turned one lane too early, and ended up taking off on Runway 26, which was too short for a safe take off of a plane of that size. Comair 1591, was a CRJ-100ER plane that was carrying 47 passengers and 3 crew members. 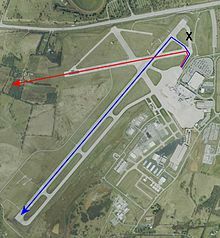 Instead of using runway 22 as expected, they used runway 26 which had too short of a path for a safe takeoff, even though Captain Jeffrey Clay confirmed using runway 22. He inadvertently took a left too early according to the map. 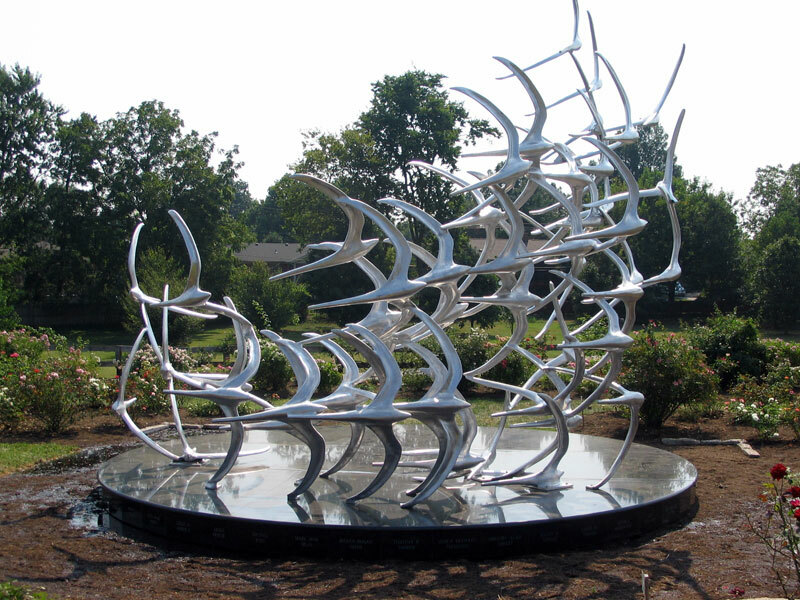 At Blue Grass Airport in Lexington, Kentucky, on August 27, 2006, 49 of the 50 passengers and crew died while taking off from the airport. 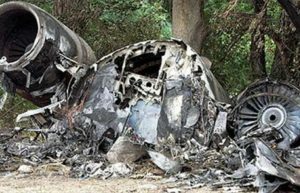 It’s hard to say at what point the pilot knew he was in trouble, but as the plane reached the end of the runway, they knew that there had not been enough time to gt the plane up to speed,and they simply couldn’t get enough lift to get it safely in the air. “They must have almost cleared the fence because only the top of it was missing and then the tips of some trees further out were also burnt off,” said Nick Bentley, who owns the 115-acre farm where the plane crashed, referring to an 8-foot metal fence that separates his property from the airport’s 3,500-foot runway. First Officer James Polehinke was the only survivor of the crash. He suffered broken bones, a collapsed lung, and severe bleeding. In the end, the ultimate blame was put on the captain, because he didn’t abort liftoff despite questioning his surroundings. Nevertheless, the airport was found to be using outdated maps and had needed to improve runway markings and conditions.So in reality there was blame to go around, and because of the errors, 49 people lost their lives that day in August, twelve years ago. “The whole airport shut down from Aug. 18 to 20,” said Brian Ellestad, the director of marketing and community relations. These days, with all the television shows about secret agents, undercover cops, and spies, most of us wouldn’t think twice about one of those positions being held by a woman. During the American Civil War, however, which basically coincided with the Victorian era, one of the most morally repressive eras in history for women, things were different. Everything from a woman’s dress to her education were tightly constricted by moral attitudes that governed her every action. Basically, women were to concentrate their “war efforts” on the task of supporting their husband, brothers, or fathers, in whatever their beliefs were toward the matter. However, as the war dragged on and more men were called into active duty, the farms, factories, stores, and schools were left without workers, so the women stepped up to stand in the gap, as it were. This was most surprising because, back then, women were considered too frail, and their minds too simple for things like politics and war. They were designed for keeping the home and taking care of the babies. 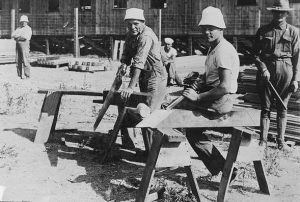 Nevertheless, when the men were called into active duty, most of them would have lost their farms, homes, and businesses had it not been for the strength and intelligence of the of the “frail and simple” women. Many women refused to limit their assistance to their country to what could be accomplished close to home. Some of them became nurses, worked to raise supplies for their troops, or even worked in armories, but there was a number of these women decided to support their country in a more dangerous…and scandalous way…they became spies.Back then, espionage was considered a very dishonorable pursuit for a man during the Civil War era, but for a woman…it was tantamount to prostitution. Nevertheless, with the war raging, women of both the North and South flaunted the Victorian morality of the time to provide their country the intelligence it needed to make tactical and practical decisions. 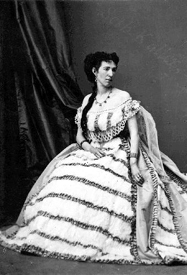 The most famous of these female spies was Belle Boyd…born Marie Isabella Boyd. 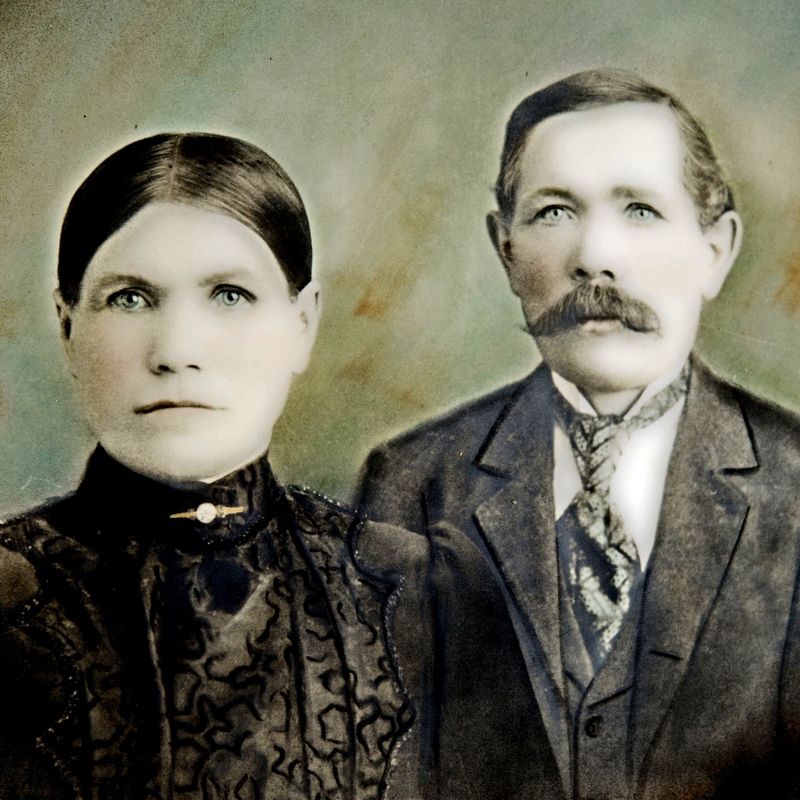 She began spying for the Confederacy when Union troops invaded her Martinsburg, Virginia home in 1861. One of the Federal soldiers manhandled her mother, and Boyd shot and killed him. She was exonerated in the soldier’s death, and an emboldened Boyd managed to befriend the Union soldiers left to guard her, and used her slave, Eliza, to pass information confided in her by the soldiers along to Confederate officers. Boyd was caught at her first attempt at spying, and threatened with death, but she did not stop her activities. She vowed to find a better way instead. She began eavesdropping on union officers staying at her father’s hotel. She learned enough to inform General Stonewall Jackson about their regiment and activities. Taking no chances, this time, Boyd delivered her intelligence firsthand, moving through Union lines, and reportedly drawing close enough to the action to return with bullet holes in her skirts. The information she provided allowed the Confederate army to advance on Federal troops at Fort Royal. Boyd’s daring acts of espionage soon caught up with her again and when a beau gave her up to Union authorities in 1862, she was arrested and held in the Old Capitol Prison in Washington for a month. Then she released, but found herself in the arrested again soon after. 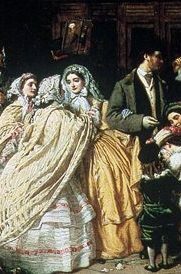 Once again, she managed to be set free, and this time she traveled to England, where amazingly, she married not a Confederate soldier, but a Union officer. Boyd wasn’t the only spy in the Civil War. Another famous female spy was nicknamed “Crazy Bet,” but her real name was Elizabeth Van Lew. Van Lew was born to a wealthy and prominent Richmond family, and was educated by Quakers in Philadelphia. 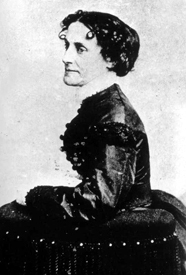 When she returned to Richmond, she had become an abolitionist. She even went so far as to convince her mother to free the family’s slaves. Her espionage activity began soon after the start of the war. Her neighbors were appalled, because she openly supported the Union. She concentrated her efforts on aiding Federal prisoners at the Libby Prison, by taking them food, books, and paper. Later, she smuggled information about Confederate activities from the prisoners to Union officers, including General Ulysses S. Grant. To hide her activities from her Confederate neighbors, she behaved oddly. She dressed in old clothes, talking to herself, and refusing to comb her hair. Believe it or not, people began to think she was insane. They started calling her “Crazy Bet.” Van Lew wasn’t insane, in fact, she was incredibly intelligent. She was hailed by Grant as the provider of some of the most important intelligence gathered during the war.